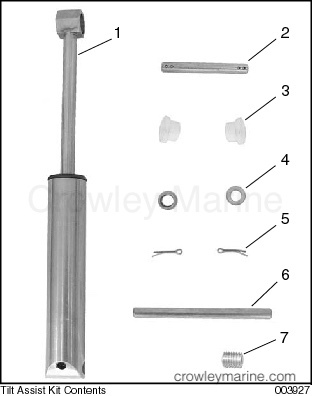 This kit is designed for use on the following 2-cylinder outboards with manual tilt: 2004 and newer Evinrude® E-TEC™ 40 HP recreational and 60 HP commercial models and 1982 and newer Evinrude®/Johnson® 40-60 HP models (including 55 HP commercial and 55 HP military models) with single-piece lower motor cover. DO NOT install on any other models. 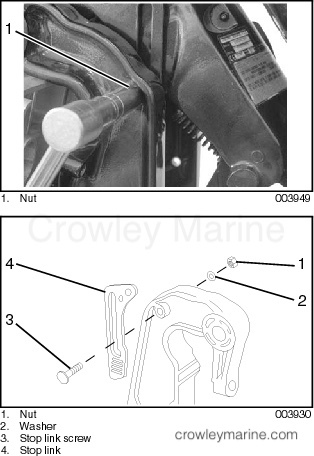 For safety reasons, this kit should be installed by an authorized Evinrude/Johnson dealer. This instruction sheet is not a substitute for work experience. 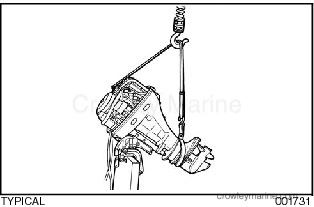 Additional helpful information may be found in other service literature for your engine. 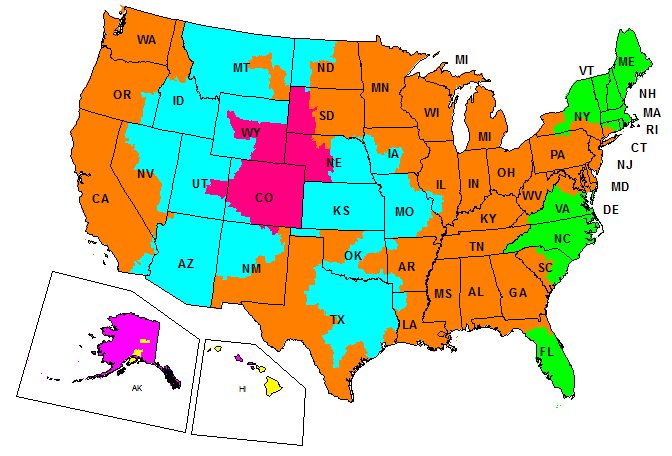 This instruction sheet uses the following signal words identifying important safety messages. IMPORTANT: Use the following instructions if your outboard has a hole for the lower pivot pin bored all the way through the starboard side stern bracket. To prevent accidental starting while servicing, disconnect battery leads from battery. Twist and remove all spark plug leads. 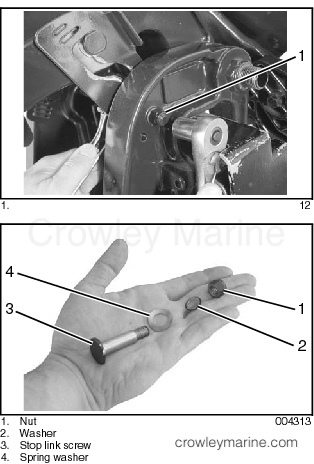 To prevent injury from contact with a rotating propeller, remove propeller before servicing. 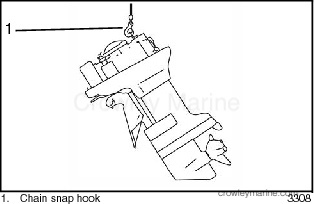 During service, the outboard may drop unexpectedly. To avoid personal injury, always support the outboard’s weight with a suitable hoist. 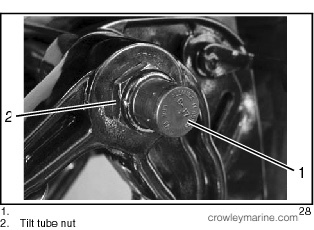 Remove nut, washer, and stop link screw from port side stern bracket. 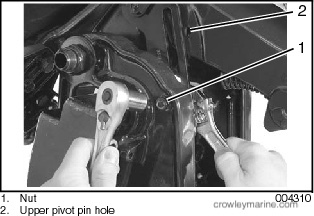 This will loosen the stop link so you can access the upper pivot pin hole. 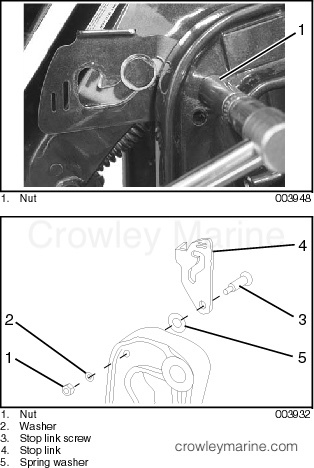 Remove nut, washer, stop link screw, and spring washer from starboard side stern bracket. 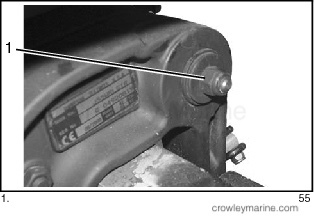 The spring washer is located between the stop link and the stern bracket. With both stop links loosened, there will be enough tilt play to install the tilt assist cylinder. Install two (2) bushings in end of cylinder. 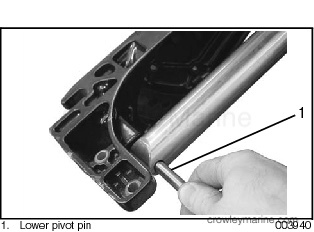 IMPORTANT: During installation and assembly, apply a light coat of Triple-Guard® grease to all pivot points. Position cylinder between stern brackets. Insert upper pivot pin through port side stop link. 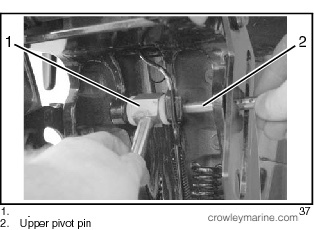 Install two (2) washers on upper pivot pin. 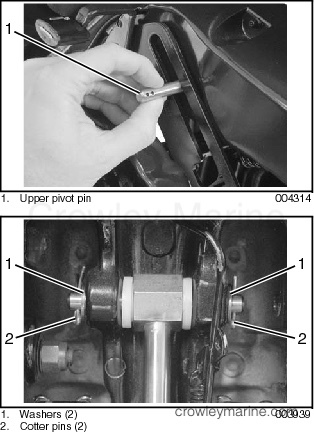 Install two (2) cotter pins in upper pivot pin holes. 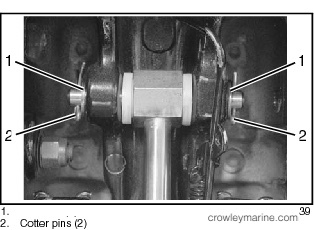 There are four (4) holes in upper pivot pin. Depending on engine model, use innermost available holes. Install lower pivot pin through hole in starboard stern bracket to secure other end of cylinder. 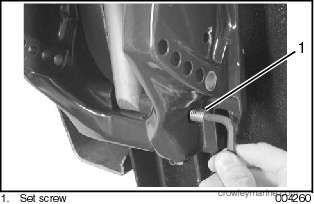 Use allen head wrench to install set screw into lower pivot pin hole until screw bottoms out. Install previously removed spring washer, stop link screw, washer, and nut through stop link and stern bracket on starboard side. 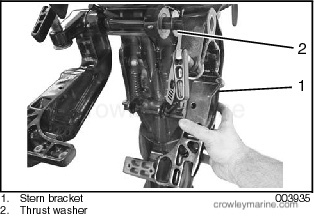 Make sure the spring washer is installed between the stop link and the stern bracket. Tighten nut to 144 to 168 in. lbs. (16 to 19 Nm). Install previously removed stop link screw, washer, and nut through stop link and stern bracket on port side. Tighten nut to 144 to 168 in. lbs. (16 to 19 Nm). 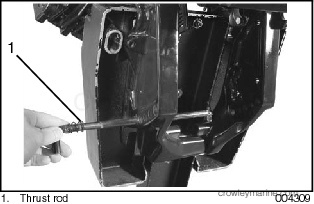 When the tilt assist cylinder is installed, the thrust rod cannot be installed in the lowest position. 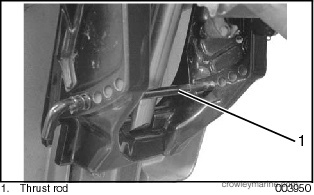 The thrust rod must be installed in one of the other positions. Otherwise, the outboard’s reverse thrust lock will not engage and/or the cylinder may be damaged. 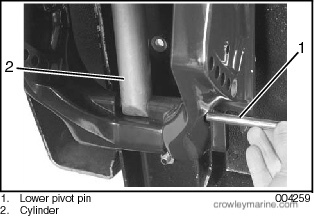 Use the tilt grip on the engine cover to tilt the outboard. 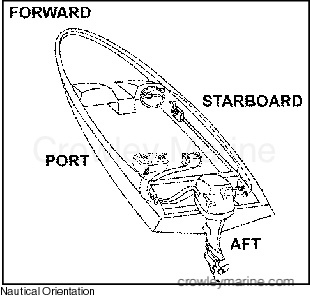 DO NOT use the steering handle to tilt the outboard. Before delivering to customer, make sure outboard tilts fully up and down and turns freely from side to side. Also, make sure reverse thrust lock engages fully. 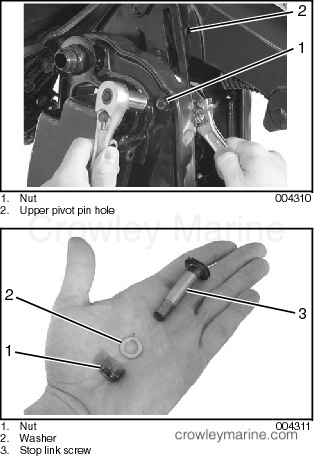 IMPORTANT: Use the following instructions if your outboard does not have a hole for the lower pivot pin bored all the way through the port side stern bracket. IMPORTANT: For applications other than Evinrude E-TEC 40 HP models, this procedure may be performed from the starboard side of the outboard. 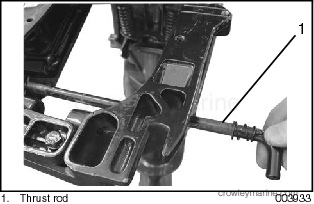 Models with tilt tube: While outboard is still mounted, remove cap (if equipped) and tilt tube nut from port side only. Models with tilt bolt: While outboard is still mounted, remove tilt bolt nut and washer from starboard side. 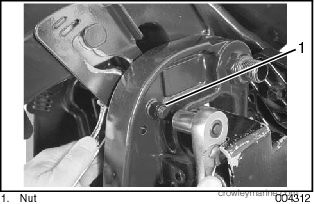 Loosen clamp screws and fasten appropriate chain and snap hook to lifting eye on engine block. 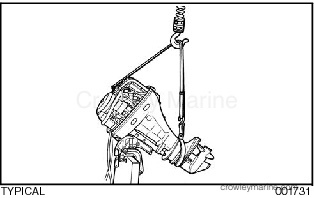 Use hoist to lift outboard from transom. 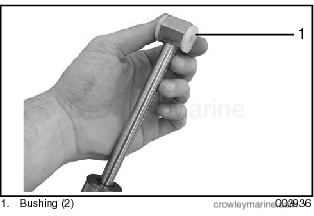 If the chain hook or snap hook is too large, the lifting eye could break. The outboard could drop suddenly and cause serious damage. 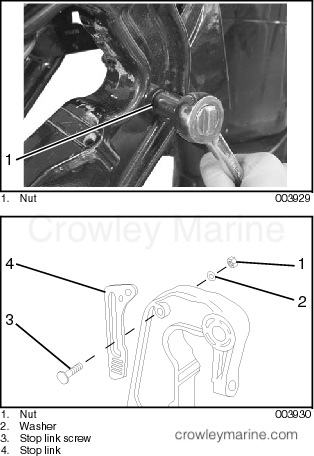 Remove nut, washer, and stop link screw from port side stern bracket. 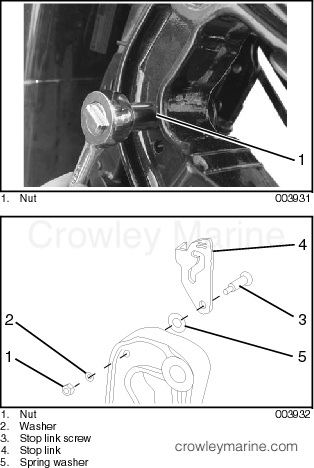 Remove nut, washer, stop link screw, and spring washer from starboard side stern bracket. 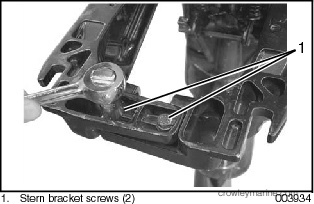 Remove two (2) stern bracket screws and lock washers. Remove port stern bracket and thrust washer from tilt tube. Install two (2) bushings in cylinder. Position cylinder between stern brackets, as shown. 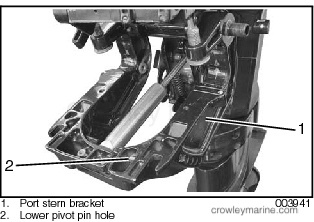 Insert upper pivot pin from port side. Install lower pivot pin through other end of cylinder and into recess in starboard stern bracket. Install thrust washer and port stern bracket on tilt tube. 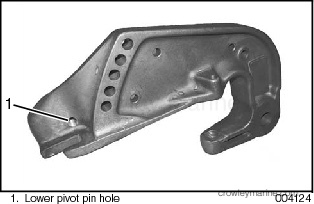 Make sure lower pivot pin engages hole in port stern bracket. Install two (2) stern bracket screws with lock washers. Tighten screws to 144 to 168 in. lbs. (16 to 19 Nm). 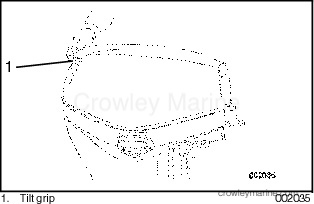 IMPORTANT: Before installing the remaining parts, lower outboard onto transom to slightly compress the cylinder. Models with tilt tube: Install tilt tube nut. 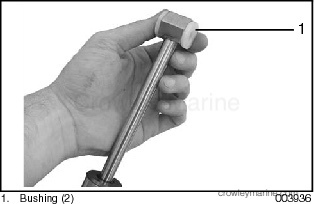 Tighten nut to 40 to 45 ft. lbs. (54 to 61 Nm), then back off 1/8 to 1/4 turn. Install cap on end of tilt tube. 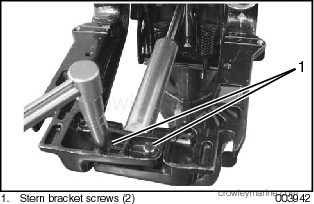 Models with tilt bolt: Install tilt bolt washer and nut. Tighten nut to 14 to 16 ft. lbs. (19 to 22 Nm).